Mallards are the most familiar and widespread duck species. The males have a conspicuous green head which has earned themselves the nickname of "greenhead." Mallards have an average length of 24 inches and an average weight of 2 3/4 pounds. 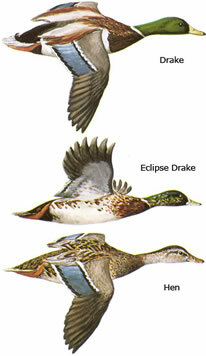 The mallard is our most common duck, found in all flyways. The main wintering area is the lower Mississippi basin and along the gulf coast, but many stay as far north as open waters permit. In South Carolina, mallards are common winter residents. 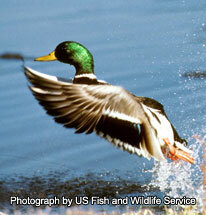 Mallards are found in a broad range of habitats and can be found in almost any wetland habitat. They frequent everything from marshes, beaver ponds, lakes and reservoirs to city parks, farm ponds, and roadside ditches. Mallards are opportunistic omnivores, feeding on insects, aquatic invertebrates, snails, seeds, aquatic vegetation, and crops. Mallards are one of the first Anas ducks to form pair bonds, which occurs from September to November. Female mallards build the nest on dry land close to water. The hen scrapes a nest in the ground and pulls nearby vegetation to the nest to use as a lining. Once the nest is complete she lays 1-13 creamy to grayish eggs. Drakes voice is a low-pitched kwek-kwek, and hens have a loud quack.